NOTE: This case study was originally published in two parts in 2010 on a blog about medical checklist design. It has since been revised and combined. I was traveling in late 2007 and happened to pick up the New Yorker issue with Atul Gawande’s The Checklist. I’m a bit of a clarity geek, so the idea of putting simple, critical information in front of surgeons to deliver better outcomes was immediately intriguing. A couple years later, we had a some down time in the studio so I approached the Surgical Clinical Outcomes Assessment Program (SCOAP) here in Washington state to learn more about the organization and their surgical safety checklist project. 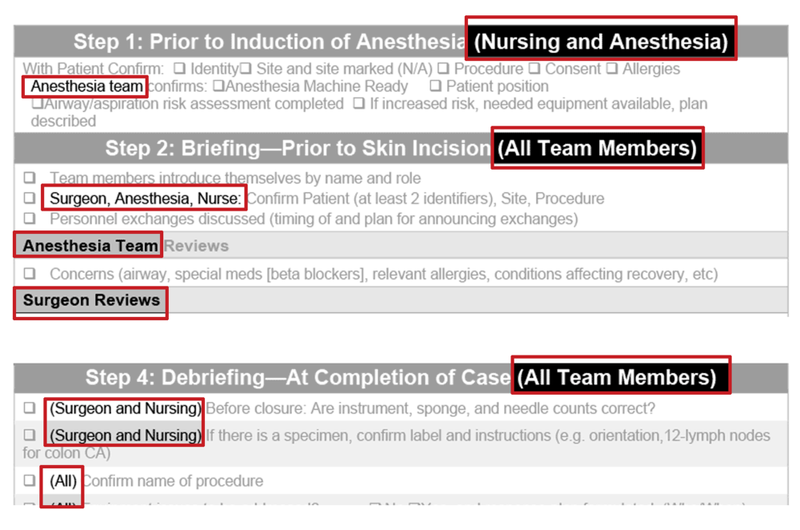 After a few initial conversations, my team and I began redesign of the SCOAP Surgical Checklist as a pro bono project. 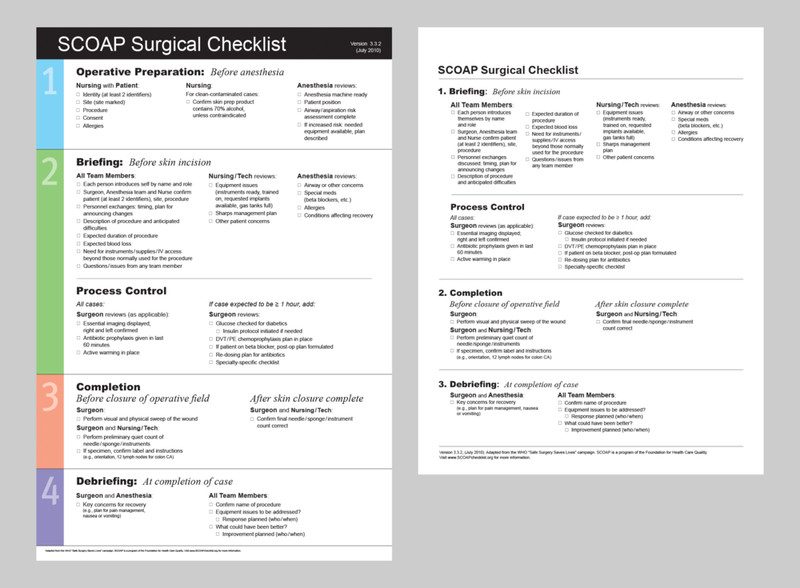 BEFORE: Two versions of the SCOAP Surgical Checklist from 2009. AFTER: The checklist was redesigned as a large printed poster, a PDF for electronic display, and a letter-size black and white version for use on a clipboard. At Emphatic, we begin all projects with a diagnostic phase. This enables us to understand the context, evaluate the problem or opportunity, and prescribe an appropriate solution. We also looked at historical versions of the SCOAP checklist and other SCOAP content. It is helpful to learn why things are the way they are, so I interviewed Justine Norwitz, then SCOAP's Strategic Development Director, to better understand the process and rationale that led to the design of their existing checklist. Next, I conducted stakeholder and user interviews with surgeons and nurses at representative institutions in Washington state (small, large, rural, urban, clinics, and teaching hospitals). The goal was to gather information about their experiences using the SCOAP Surgical Checklist, uncover problems or concerns, learn about modifications they made, and ask for their insights about possible improvements. We prefer to conduct observational research as well, but limited time prevented us from seeing the checklist in action in operating rooms. Fortunately, we had high quality information from the interviews and video of the checklist being ‘run’ by a surgeon, so we were able to move ahead with confidence. The SCOAP surgical checklist had been widely adopted in a short period of time, in part because it has been championed by individual surgeons in influential institutions. I was surprised to learn that few of the institutions I interviewed had a formal training program to help staff understand and follow the checklist protocol. This stood out as a key unexplored opportunity -- to create a framework that institutions can use to train surgical teams and other stakeholders on surgical checklist adoption and use. Information. We created an information inventory by cataloging and categorizing the existing content. That process enables us to understand and prioritize the core pieces of information -- who does what, when, under which circumstances? -- as well as ancillary information like title, logo, copyright, etc. We used the inventory as a foundation for all subsequent visual design choices. Visual design. We evaluated the existing design in light of our experience, established best practices, and the literature on checklist design. Updated content. Last in this phase, we looked at how to best incorporate proposed changes from SCOAP and checklist users. Make content easier to navigate. Offer facilities a choice of format. Make it easier to customize the checklist. Remove Yes, No, and N/A check boxes (no facilities were writing on the checklist). Remove the logo and add the SCOAP name to the footer. Make footer content small and move it to the bottom to expand space for tasks. Create separate clip-board and poster versions and optimize the text size and the flow of content in each format. Create a distinct version without pre-operative safety checks for facilities that perform those checks in a separate location and/or use a separate checklist for those tasks. Create editable Word layouts for each of the final four checklists (in addition to the PDFs delivered for print and screen use). Write easy-to-follow instructions to help facilities edit the SCOAP checklists. Inconsistent list orientation. Lists of task items were presented as both horizontal and vertical lists. Roles treated inconsistently. Role names were shown in several different sizes, sometimes inside parenthesis at the end or the beginning of headings, and sometimes within task items — very difficult for people to scan for their role! Alignment undermines the purpose of the text: Because section titles were centered, the step numerals were not in a consistent position (they shifted left and right on the page) and were hard to distinguish quickly because they sat in the middle of other text. Visually complicated: The use of gray shading was inconsistent (sometimes used for headings, sometimes used to highlight every other line in a list). That, combined with large dark areas and black lines around all the rows columns made the document feel complicated. A large logo and lengthy footer reduced the space available for task items. Boxes and arrows disrupted flow: One version of the original checklist tried to present one path for short surgeries and a different path for all others, but a heavy line around two boxes in the middle of the page (plus a large dark gradient arrow) grabbed too much attention and made the overall flow of the checklist hard to follow. Also note that the box labels (“Case expected to be…”) were styled inconsistently, so it was not clear at a glance how the content in the boxes was related. Cool, glad you’re interested! You’ll receive an email asking you to confirm your request, just click the link in the email message.